Monsoons always come with unexpected rains, drenched clothes,and completely messed up hair and makeup. It is always better to be cautious about your dressing and make up to save yourself from the splashy season. Follow these fashion tips to look bright and colorful this monsoon. • Do not wear too much make up, because if it rains and you get drenched, your makeup will run down your face and spoil your skin. • Use a waterproof liner and kajal during rainy season. • Do not tie your hair too tight as it will only make your hair lose its natural moisture. • Always paint your toe and finger nails, to avoid them from looking dirty. • Monsoon is a season of vibrant colors. Accessorize yourself with colorful bags and vibrant colored clothes. You can also try bright floral prints. • Denims are a total no-no. • You need material that dries quickly and keeps you warm. So, go for poly fabrics, nylons, soft cottons, cotton blends, mixed fabrics or net fabrics for monsoon. • Avoid crepes and chiffons as they get wet and crinkled easily. • Go for short, knee/ ankle length bottoms rather than long ones. • Avoid wearing light colored clothes, especially bottoms, as they can get stained with mud. • Avoid wearing flip flops as they tend to stain your legs or bottoms. • Avoid leather clothes and foot wear, as humid weather can easily spoil them. • Use umbrella or raincoats with funky, colorful prints. • Formal or casual, make sure your bag is water friendly. 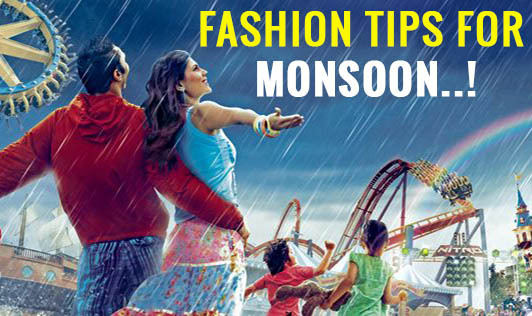 Follow these simple tips, to keep yourself trendy and dry this monsoon..! !